Hi everyone! This is part of our family’s story. I have prayed for a little girl since I was 12 yrs. At 30, I finally met and married Brad. We were so excited to be pregnant with our first child(ren). They, however never developed in my womb. The doctors called this a blighted ovum. My body wouldn't miscarry my precious children, so the doctor wanted to do a D&C. I made her wait for 6 weeks or more until I was sure that the baby(s) were really not developing. It was Christmas time, and I was a workaholic, (before my injuries and illnesses, that came after Hannah was born.) The doctors told us we had to wait another year to get pregnant. So we waited. The advice seams bogus now. Then the Lord blessed us again with our "precious angel", Hannah. I did everything I could to make the pregnancy perfect. I didn’t drink caffeine. I made sure each meal I had all the food groups, etc… I was scared the whole pregnancy. I bled a little, due to placenta previa that corrected itself. Hannah tested positive for Down syndrome, by a triple screen test. Then, I saw a specialist and everything seemed alright. I remember that I wanted to play a more active role in servantship towards family’s and children with disabilities. After Hannah was born, I tried to find ways to help out with Down syndrome kids and their family’s, but couldn't seem to find any ways to do so. Isn't that sad? I wish that others would have easier access to knowing how to help with all of our situations. Hopefully getting Hannah’s story out will help spark compassion, resources, and community, and of course complete pre-born screening in all 50 states. :) As well as, love, and hope, for those living with disabilities. It is funny that I wanted to help before we knew Hannah had GA1. Finding out about her illness was a very long road, which, I will try to share briefly. At 1 day old Hannah could hold her head by her self. She was very strong the doctors said but she was very fussy from the pain she had. She was very beat up from a very traumatic birth that was uncalled for and disabling for me. I am permanently disabled from the injuries I sustained from her traumatic delivery. Her first week, Hannah turned blue and aspirated on day 2 and lost around 6 lbs. (?) Then Hannah became extremely jaundice. I attributed it to birth injuries. After all, they ripped her out with forceps after other many aggressive things. We should have been offered a c-section! After longer than a week in the Hospital we came home. I cried and cried something felt wrong. I knew I wasn't postpartum, so I attributed it to my incredible pain and injury’s. At 1 month or so I noticed problems with Hannah's head denting in. Then she lost some of her ability’s. I wondered did I imagine she could do these advanced things. Then, her head, where her soft spot was, started rising up on one side, she was extremely fussy (beyond colic!) She would empty her entire stomach 5 to 12 x a day. (This happened for three years!!!) She couldn't sleep unless she was in our arms upright and we didn’t move so much as twitch or we would awaken her to start a 3 hour or more ordeal again trying to calm her down enough to sleep and stop vomiting. At 2 months finally her head was so asymmetrical that our friend and doctor and huge lover of Hannah grew concerned so we had a CAT scan over a month later. The hospital read the CAT scan as "normal" with extra benign axial fluid of infancy. Which 2 or so weeks ago I found out that it clearly showed GA1 findings. Hannah was always screaming, non-sleeping, hungry baby. I felt she needed more than my breast milk, but when I would try formulas to supplement, she would really be vomiting. We tried many, many brands of formula, with no success. I thought the screaming threw the night was night terrors remembering her traumatic birth. I still wonder about that? At 4 months (I think) she had a reaction to immunizations. After that well baby check I was complaining to our doctor that something seemed to be wrong as I thought again she had lost skills, and seamed like she was now not going to be able to sit up. (This was due to dystonia.) I was told that I was being a "perfectionist" and basically relax. I tried to explain without the proper terminology that she seemed like she would never be able to sit up. She also didn’t have any protective reflexes. The doctor, Laura, said baby’s usually sit up at 6months or so, and not to worry. So we waited till 6 months, yet Hannah still had no foreseen strength and ability to sit in my mind. 8 months the same scenario was expressed, with don't worry. 10 months the same…so I took her to see my childhood pediatrician. He said "it’s good to be skinny," and she's "fine" “her constipation will go away,” Not getting any answers became too much for me, so I heard about child find evaluations, and set an appointment. After many no shows they evaluated her and told me she had Hypertonia with possible cerebral palsy. Than finally, our doctor listened and set an appointment for around 2 months later to see a child development doctor. (Why she didn't send us to a neurologist I will never understand.) This doctor diagnosed her with spastic C.P. While I was waiting for an appointment, I was desperate for answers. I went to many doctors, tried going to The Children’s Hospital ER and tell them she fell, so they would do a MRI, but I was unable to successfully lie. Not that they do an MRI on the weekend anyway. WHEW!!! Now I know with her condition being mistaken for shaken baby syndrome that could have been a fatal catastrophe for Hannah. If I wouldn’t of been there, with her, to listen to my God given instinctive responses to feed and hydrate her all day long, if I would of been suspected for child abuse, like so many of you were. (My heart goes out to you!) I believe foster care wouldn’t have had those needed instincts, because Hannah has always seemed to deteriorate quickly. Finally we were given spastic cp diagnosis, and then sent to an idiot neurologist, who said low tone cp. We went to 4 neurologists, 3 geneticist’s etc. I always questioned everyone, because they said Hannah was dismorphic, but isn't, and they would test her for disorders she had no symptoms of. They did swallow studies, EEG's, EKG’S, sleep studies - this is where she meets one of the doctors who discovered GA1, yet still no GA1 diagnosis. She had 2 more MRI's over the course of two more years. I just found out the MRI’s were "text book" of GA1 findings, yet no diagnosis. I kept seeking answers for Hannah because I knew she shouldn’t be non-ambulatory, aspirating, fussy, tiny, big head, slow hair growth, puking the entire time child… But most importantly, I wondered if she had bleeding on the brain due to asymmetry. I instinctively new her immune system was very week. Therefore I was very protective of her. Being protective and advocating, and seeking answers made people (Therapist mostly) think I was crazy. Also the new friends I made in Denver fled when they realized Hannah was disabled. I was left with no one to believe me, or listen and support me. Not my husband, family, and friend’s, or professionals. This was crazy, especially since she was so sick and non-ambulatory. ​Finally, when Hannah was around 2.5, we set an appointment to see this, “incredible” doctor. After 2 attempts, and around 9 months, we were finally able to see this awesome neurologist who finally diagnosed Hannah right away. Her boss, the idiot neurologist, would always come in instead of letting her, Dr. Parsons, see Hannah. I believe he was covering his tracks. He after many questions to him about Hannah’s possible seizures and weird MRI's gave her another wrong diagnosis of Perisylvian Fissure Syndrome. I said to him right there that the assumption wasn’t correct because Hannah was already advanced in speaking, even if he didn't choose to listen past the hard articulation. In September of this year, we saw Dr. Morton and he believes the 4 or so people with Perisylvian Fissure Syndrome are actually GA1 cases. 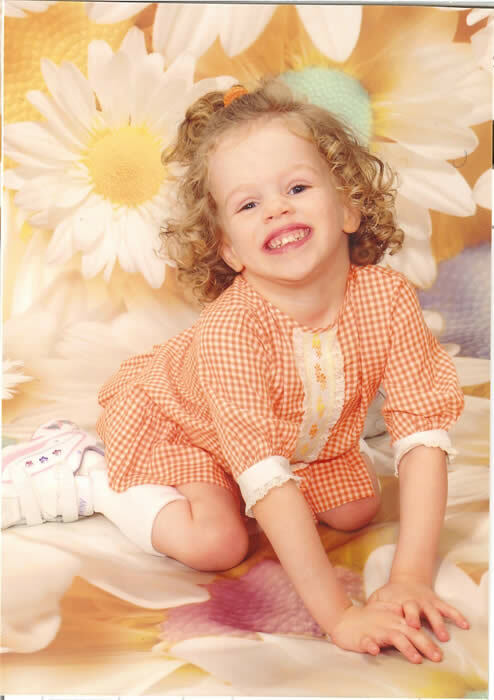 Hannah was three when she was finally diagnosis. I'm extremely glad she is alive. :) !! We probably had her on around 36g of protein a day before we knew. She had extreme feeding issues, and still does, so back then we feed her soft mechanical foods to avoid choking, vomiting. The soft mechanical foods we used were high levels of protein like yogurt etc... It is actually a miracle that Hannah is alive and doing as well as she is. Even though her disorder wasn’t properly diagnosed, for almost 3 yrs., even when all the evidence was obvious! It is also a shame we were not told that for $25 we could have had a more expansive newborn screening for 27 additional Disorders here in Colorado. I will be calling Pediatrix to order a kit for newborn screening that will test for about 50 disorders. This kit will be for my son Kyle. I believe, he has autoimmune dysfunctions, like me, but I’m not sure. He has constant swelling of his forehead, fingers, fevers of 102 at least once a month and pain daily everywhere, which increases with age. Do my son’s symptoms sound familiar to anybody? Also, I have severe CFIDS, Gluten Intolerance, etc. Please pray for the answers to Kyle’s issues be found out threw your answers or the screenings. It is cheaper to pay Pediatrix the almost $90, which equals 3 co-pays, and of course a lot cheaper than having a medically fragile child!? I’m getting the, "your crazy" thing again, and tired of chasing after the wind, especially since I’m so sick. I pray that he will be o.k. until I figure it out.